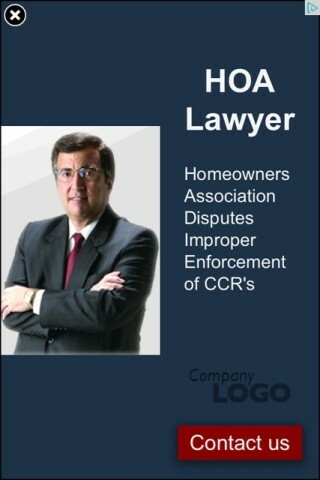 From the Law Offices of Company Logo, LLP! HERE’S a fun one that will brighten your day. I was playing one of those electronic games on my iPod, and like you, I’m too cheap to pony up the $1.99 for the paid version, so I just download the free version and deal with an ad every eight to ten seconds or so. Evidently this guy’s specialty is homeowner association disputes, but I bet the makers of Donut Dash hope he doesn’t know much about the law with regards to online advertising contracts…or else he might sue them for not including his name in the ad! Ha! Yep — already sent it off to the folks at Reader’s Digest. Keep your fingers crossed! Posted by Ted on April 30, 2015, 3:31 AM.